Updated (2 July 2013) with numerous details. cable channels include: ESPN, ESPN2, TNT, Disney, ABC Family, Fox Sports West, TWC SportsNet, CNN, CNBC, Nickelodeon, A&E, Discovery, Bravo, USA, TLC, MTV, Fox News and Syfy (update: also FX, TBS, WGN, MundoFox, QVC, HSN, MSNBC, Headline News, Galavision, BET, VH1, Weather, Spike, Travel, Food, HGTV, Lifetime, E!, Comedy Central, History, Fox Sports Prime Ticket, AMC, TCM, TV Land, Cartoon, Animal Planet, Speed, CMT, Golf, TWC Deportes, C-SPAN, C-SPAN2, National Geographic, Palladia, Velocity, The OC Channel, Cox 3/California Channel). This lineup appears similar to a typical expanded basic with the addition of a few purely HD services that are usually bundled with expanded basic for customers with HD boxes, namely Palladia and Velocity. update: free on-demand is "coming"
Cox is certainly taking the position that the cable TV rights that it has are suitable for this IPTV service. While it is new for an operator to offer IPTV service as well as traditional cable on the same system; it is not unusual for operators to offer IPTV service (AT&T and Google Fiber offer IPTV service exclusively; many other distributors offer it on some systems). Why are any of the channels carried in SD? Typically cable operators break out the broadcast channels in a separate tier from the cable channels to minimize their copyright royalty payments (e.g., a $20 basic broadcast tier is available, then a $40 cable program service tier --that 90%+ of subscribers purchase -- is available above that -- copyright fees are based on the $20 price, not the $60 price). Is this package subject to a different (or no) copyright royalty payment scheme? This package appears to contain most, if not all, of the most expensive cable channels -- usually cable operators are trying to create new packages which exclude those services (like Cox's own TV Economy package). What is the complete channel lineup? 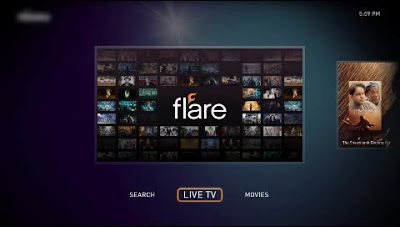 (I have searched cox.com, but haven't been able to find reference to flare or flareWatch yet). Update: flareWatch has its own website that does not mention Cox, except in the fine print at the bottom. Is Cox's brand name an impediment to selling the service? The branding of the service is inconsistent. 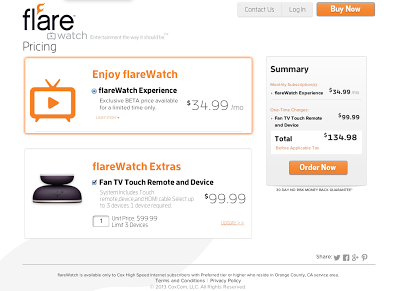 The URL for the site is watchflare.com. 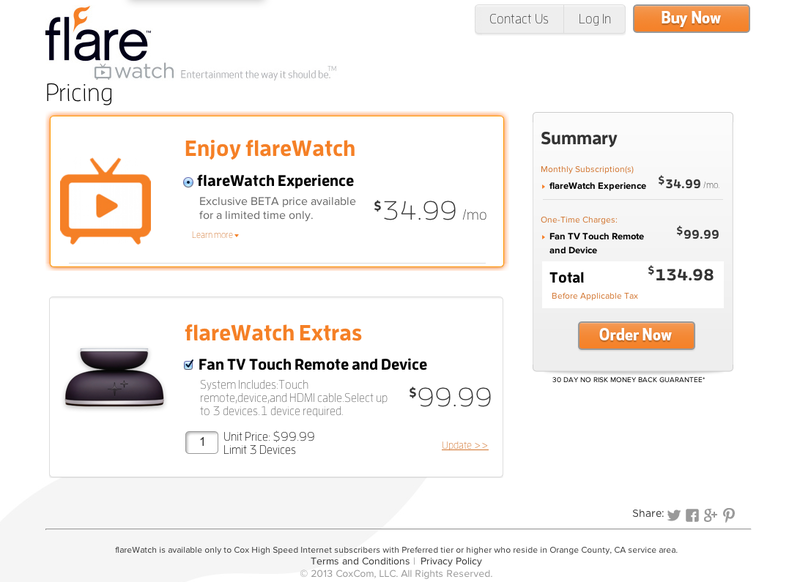 The service name is styled "flareWatch" on the site and simply "flare" on the demo. If the target for this service is customers who have Cox Internet service, but do not have Cox TV service, why is the lineup so traditional in its selection of services?